President Obama’s plan for a military campaign against Islamic militants in Iraq and Syria is drawing public support. And, in a rare display of bipartisanship, majorities of both Republicans (64%) and Democrats (60%) approve of the president’s plan. The new national survey by the Pew Research Center, conducted Sept. 11-14 among 1,003 adults, finds that overall, 53% approve of Obama’s plan, while 29% disapprove; 19% do not offer an opinion. However, as many say their greater concern is that the U.S. will go too far in getting involved in the situation in Iraq and Syria as that it will not go far enough in stopping Islamic militants (41% each). That represents a shift in opinion since mid-August, when by 51% to 32%, more said their bigger concern was that the U.S. would get too involved in the situation in Iraq. Despite bipartisan support for Obama’s military campaign against ISIS, Republicans and Democrats differ in their concerns for U.S. military action: Most Republicans worry it will not go far enough (66%); by contrast, 54% of Democrats say their bigger concern is that it will go too far. The survey finds that relatively few Americans believe that the military campaign against Islamic militants will make the United States safer from a terrorist attack. Just 18% think it will decrease the chances of a terrorist attack in this country, while nearly twice as many (34%) say it will increase the chances of an attack; 41% say it won’t make much difference. While support for military action in Iraq and Syria crosses party lines, there are significant difference in opinion across demographic groups. 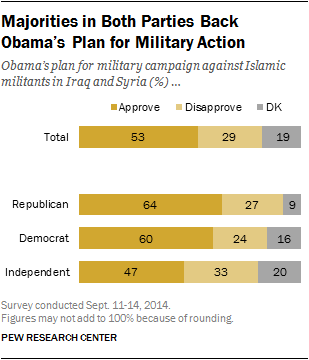 Men approve of the military campaign against Islamic militants by a wide 62%-25% margin. By contrast, women are much more closely divided: 44% approve of the plan, while 33% disapprove. Across age groups, young people offer the least support for military action. Just 43% of those under 30 approve of Obama’s plan, while 37% disapprove. Among older age groups, half or more approve of the plan, including 61% of those 65 and older. Those with a college degree (60%) are more likely to approve of the military campaign in Iraq and Syria than are those with no more than a high school diploma (48%). While Democrats generally support Obama’s plan for a military campaign against ISIS, they continue to express concern that the U.S. will become too deeply involved in Iraq and Syria. Twice as many Democrats say their greater concern is that the U.S. will go too far in getting involved in this situation as not go far enough in stopping Islamic militants (54% vs. 27%). That is changed modestly from mid-August, when 62% of Democrats expressed similar concern (the question in that survey asked only about U.S. military action in Iraq). Republicans continue to say their greater concern is that the U.S. will not go far enough in stopping Islamic militants in Iraq and Syria (66% now, 57% in mid-August). Independents have become less concerned about U.S. involvement in the situation going too far. In mid-August, 56% of independents said their greater concern was the U.S. getting too involved in the situation compared with 28% who were more concerned the U.S. would not go far enough to stop militants. 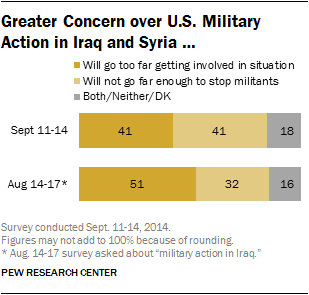 In the current survey, about as many say they are more concerned the U.S. will not go far enough to stop the militants (40%) as go too far getting involved in the situation (42%). The gender and age differences in views of Obama’s plan are evident in concerns over U.S. military action: more women (46%) than men (35%) say their greater concern is that the U.S. will go too far in getting involved in the situation in Iraq and Syria. Young people are more likely than older adults to express concern over getting too involved in this situation. Few Say Campaign Will ‘Decrease’ Chances of Terror Attack in U.S. The U.S. military campaign against Islamic militants in Iraq and Syria is not seen as reducing the chances of a terrorist attack in the U.S. In fact, somewhat more say the campaign against the militants will increase the chances of a terrorist attack in the U.S. (34%) than decrease them (18%); a 41%-plurality says U.S. military actions in Iraq and Syria won’t make much difference on the chances of a terrorist attack in the U.S.
Nearly four-in-ten Democrats (38%) say the chances of a terrorist attack in the U.S. will increase as a result of the military campaign in Iraq and Syria, compared with 15% who say they will decrease. Among Republicans, roughly as many think the chances of a terrorist attack in the U.S. will increase (28%) as decrease (23%). The public most closely followed news about ISIS last week, as 37% say they tracked reports “very closely.” By comparison, 23% closely followed news in mid-August about airstrikes in Iraq. 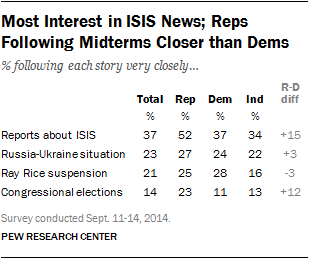 Last week, Republicans were 15 points more likely than Democrats to closely follow ISIS news (52% vs. 37%). Two other stories received modest attention from the public. Nearly one-in-four (23%) closely followed the situation involving Russia and Ukraine, similar to early August (24%). And 21% paid close attention to news about the NFL’s suspension of Ray Rice after a video showed him punching his then-fiancée. Just 14% are closely following the midterm congressional elections, which will take place in seven weeks. This is less interest than at a similar point in 2010 (22%), but similar to 2006 (16%) and 2002 (17%). Today, Republicans are twice as likely as Democrats (23% vs. 11%) to be closely following news about the midterms.